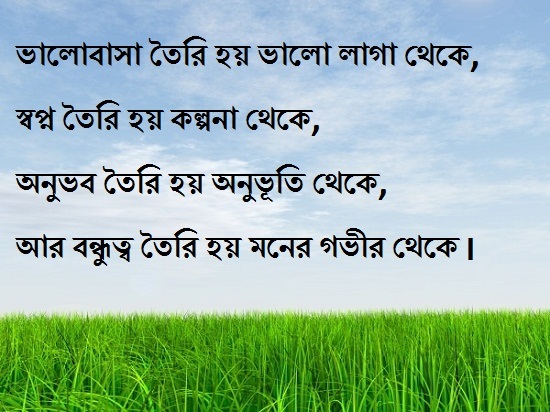 Here you will get huge bengali shayari. We can say bangla sms. All sms are very nice and fresh. You can share this shayari with your friends and any other. Here you will get bengali love shayari, bengali birthday shayari, bengali sad shayari and many more. Which you can send to your loved person. 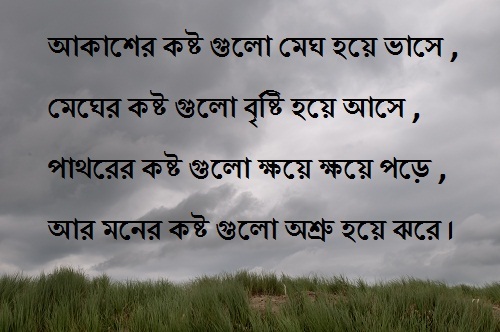 All bengali shayari written by our expert content writer. So you will love these all shayari. We always try to share the best content with our reader. Just read our all shayari and share with your dear. Express you new life with these nice and best bengali shayari. kauke sara jibon kache pete chao ? tahole prem diye noy bondhutto diye agle rekho, karon prem ekdin hariye jabe kintu bondhutto konodin haray na. karo jonno buker moddhe sunnota onuvob korar nam valobasha. karo sathe pasha pashi cholar tibro icchar nam valobasha. karo sathe kotha bolte na pere chot pot korar nam valobasha. kauke niye vabte valo lagar nam valobasha. kauke sukhi dekhe nijeke sukhi vabar nam valobasha. karo chokher kone du fota jol dekhe kede felar nam valobasha. karo kach theke kichu pabo na vebeo kichu paowar asha korar nam valobasha. “kichu na” ei kothar majhe onek kichu lukayito thake. kokhono thake rag, kokhono thake na bola kosto. abar kokhono thake abeg misrito valobasa. tor hridoyer majkhane te rakhbi amay bedhe ? thot bakiye bolbi hese “matha kharaf ! pagol nebo sedhe ? তোর হৃদয়ের মাঝখানে তে রাখবি আমায় বেধে ? ঠোট বাকিয়ে বলবি হেসে মাথা খারাপ পাগল নেব সেদে ? ar tar majhe gore uthe choto choto asha. ar bondhutto toiri hoy moner govir theke. 16 koti lok, 8 koti kaj kore, 3 koti student, 2 koti sopno dekhe, 2 koti 99 lakh 99 hajar jon prem kore, ar baki 2 jon afni ar ami cholen bondhutto kori. “pakhi” noy je ure jabo, “surjo” noy je dube jabo, “prodip” noy je nive jabo. ami to tomar “bobdhu” tai chirodin pashe robo. Bondhu to sobar e thake, tobe joriye dhore kadte parar moto bobdhu khub kom thake. Golap jemon ekti bishesh jate phul, bondhu temonoi ekti bishesh jater manush. Otiter kotha vule jao, vobissoter kotha mone koro na, ajker dinta valovabe upovog koro, Shuvo jonmodin. Otiter sob na paowa gulo vule giye agamir sopno gulo sotti korar pothe egiye cholo. Happy Birthday. valobeshe jani tomay shuvo jonmodin. kintu bujhar moto keu nei. 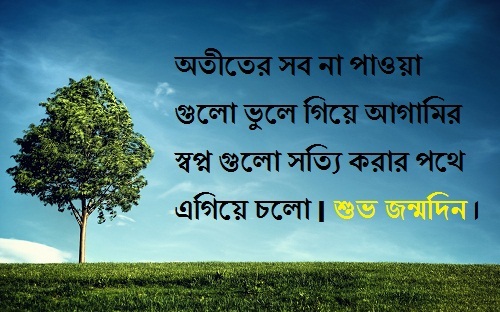 Othiti pakhi hoye karo jibone jeo na hoyto tumi take kichudin hasabe,. kintu tumu jokhon chole jabe apon thikanay, se sara jibon kadbe sudhu tomar bedonay. Onno karo hate tomar sukh amanot dio na, karon se hariye gele sukh keo tumi ar khuje pabe na. akah ache bolei megher hoyeche sristy. megh chara se dehete vasbe na ar keho. 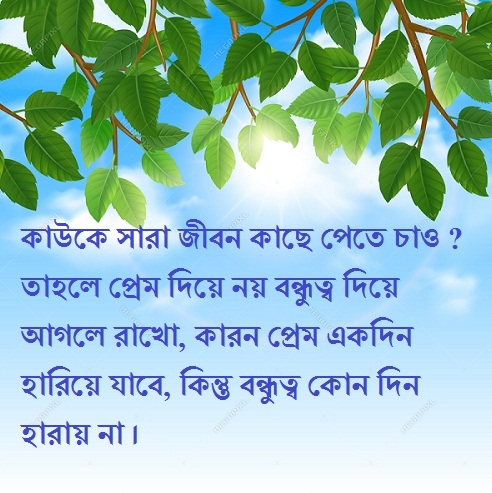 ar moner kosto gulo osru hoye jhore,. khub khub sundor amazing very nice.